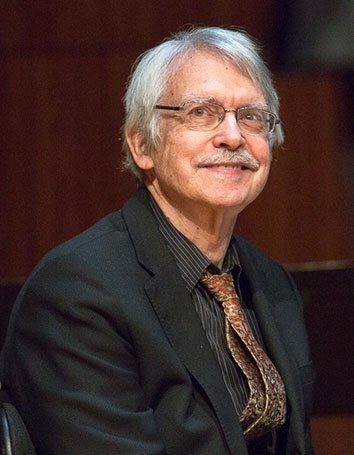 Boston has more than one fantastic orchestra, as Boston Modern Orchestra Project thoroughly demonstrated in a landmark concert honoring the 80th birthday of John Harbison on Sunday in Jordan Hall, BMOP presented four works which showed the range of the composer’s vision and mastery. Remembering Gatsby: Foxtrot for Orchestra (1985) grew out of Harbison’s sketches for a full opera, which would not be completed for another decade or more, commissioned by the Metropolitan Opera in honor of Music Director James Levine’s 25th year with the company. Strongly reminiscent of the overture to Verdi’s Rigoletto in form, (dark brooding chords which dissolve into party music), it powerfully evokes the flapper era while hinting of the tragic undertone of Fitzgerald’s novel. The orchestra as a whole seems to represent the undercurrent of fate while the “jazz combo” plays the glittery theme that expresses the effervescence of the Jazz Age to perfection. Kudos to saxophonist Philipp Stäudlin (and the whole combo), who very effectively created the hollow, muted sound of an old Victrola album without the pops. 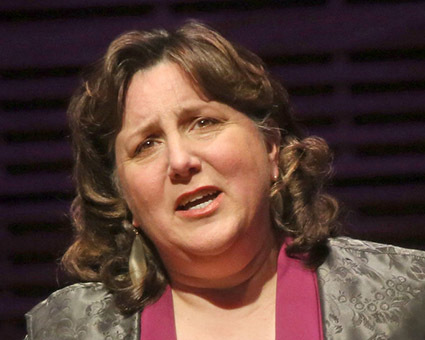 Milosz Songs (2006) featured Dawn Upshaw in this setting of Czeslaw Milosz texys. Upshaw is nothing less than a national treasure, and this work gave her ample room to demonstrate her clear tone, her judicious use of vibrato to color, her impeccable phrasing, and her brilliant musicality. It takes a thoughtful musician to tease a beautiful phrase out of non-traditional harmony, and she has this gift in abundance. A sextet of instruments (3 different flutes, percussion, etc.) at times plays alone, at times with the orchestra, and at times with the soprano. The handout speaks of Milosz’s personal barriers, and protective walls, understandable for someone who lived through both National Socialism and Polish Communism. Harbison’s sometimes dark language also suits this text. The Viola Concerto Viola (1990) featured Marcus Thompson. The three movements, Con moto, rubato, Allegro brillante, and Andante came across again dark and brooding, with the viola often a single line, a voice leading through a forest, as it were, with flashes of dissonance in the brass and at one point, a jagged waltz and a few jazzy interludes. Harbison played the viola himself, and claims that this concerto is for the violist he never became. It certainly provided a workout. Thompson handled all of the technical challenges with such ease that it was possible to hear the melodic lines without thinking of the difficulty in creating them. The final 3 downbow gestures by first the soloist and then the orchestra made for a humorous ending. A brilliant example of Harbison’s work, Symphony No. 6 (2011), opens with a setting of James Write’s “Entering the Temple of Nimes,” again featuring Upshaw; she made of the highly disjunct setting of the text, a smooth connectedness. Harbison tends to favor the use of seconds (two notes very close together in the scale), which shimmer as they clash, making for a mist of harmony out of which arises a single line. The notes describe his style perfectly “Dark themes are tempered by a mature sense of classicism, one where Harbison makes good use of modernist, post-serialist atonality as contextualized by the accessibility of a neoclassical transparency of form and structure.” Harbison wrote that he had lost his original sketches for this work, and recreated what he could remember, only to find the original notes later, and see where his mind and memory had created something even more attractive from the loss. The cimbalom, a Hungarian folk instrument which sounds a little like a metallic stick hitting a piano string, was used throughout to great effect. It paired smashingly with the marimba at times. The Boston Symphony Orchestra commissioned it in honor of its former music director, James Levine. Gil Rose led throughout with a clear and unfussy style that brought the best out of his superb ensemble. This was probably not easy music to realize, but they made it sound and meaningful and inevitable. All-in-all, a historic event. An excellent review of a stellar concert. A non obvious subtext is that Harbison and M Thompson have both made their academic home at MIT for over 4 decades. Kudos to MIT for hosting such musicians- along with Elena Ruehr, David Deveau, Evan Ziporyn and many other luminaries-as a professional cohort. MIT is a singular environment for great musicians and this concert demonstrated this in spades. As for this review, it is always a treat to read one that adds to one’s perceptions. This one did, in spades, on Harbison’s compositional techniques, Upshaw’s musicianship, Thompson’ phenomenal skill—all conveyed by Birdseye without being pedantic. “Unsung treasure”: an odd choice of words for a music department. Is that like a wristwatch with “timeless quality”?